#stampinup #faithfulinkspirations I'm very fortunate to have a job that allows me travel. I get to go to amazing places that I wouldn't be able to otherwise visit. Last fall I traveled to Mainz, Germany, home to the Gutenberg Museum and the Mainz Cathedral. It's a pretty town with lots of little shops and restaurants, right along the beautiful Rhine River. During my stay, there was a farmer's market in Mainz old town, right in the cathedral square. There were stalls and stalls of fruits, vegetables, and amazingly beautiful flowers. I took lots and lots of pictures. 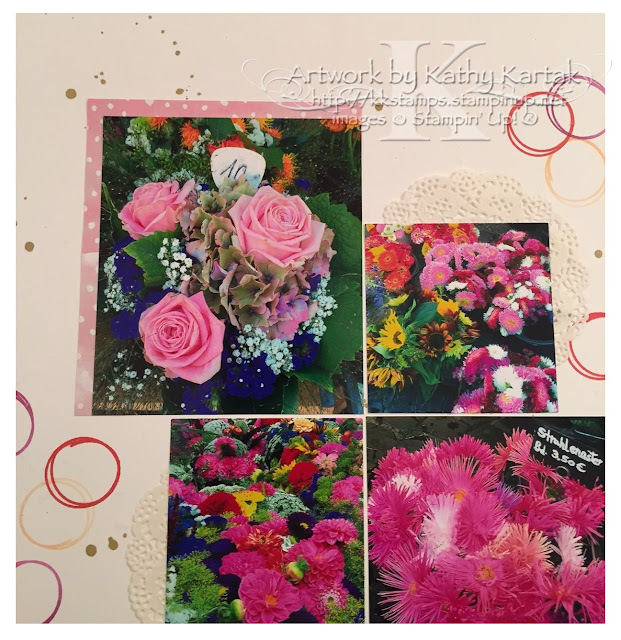 I knew I'd need some shots for a scrapbook layout for my display stamper projects--and the flower stalls were the perfect subjects! I started with a 12" by 12" piece of Whisper White Card Stock. I stamped the scribbled circle image from the "Iconic Occasions" hostess set (item 143199) in Melon Mambo, Rich Razzleberry, and Blushing Bride inks--some full strength, and some stamped off. Then I flicked Gold Wink of Stella onto the page for some random gold flecks. While that was drying, I added a piece of Fruit Stand Designer Series Paper to the two larger photos and a bit of Delicate White Doily to the two smaller photos. I adhered these to the page with Fast Fuse Adhesive. I used the Project Life Journaling Pen to add the description to the page. 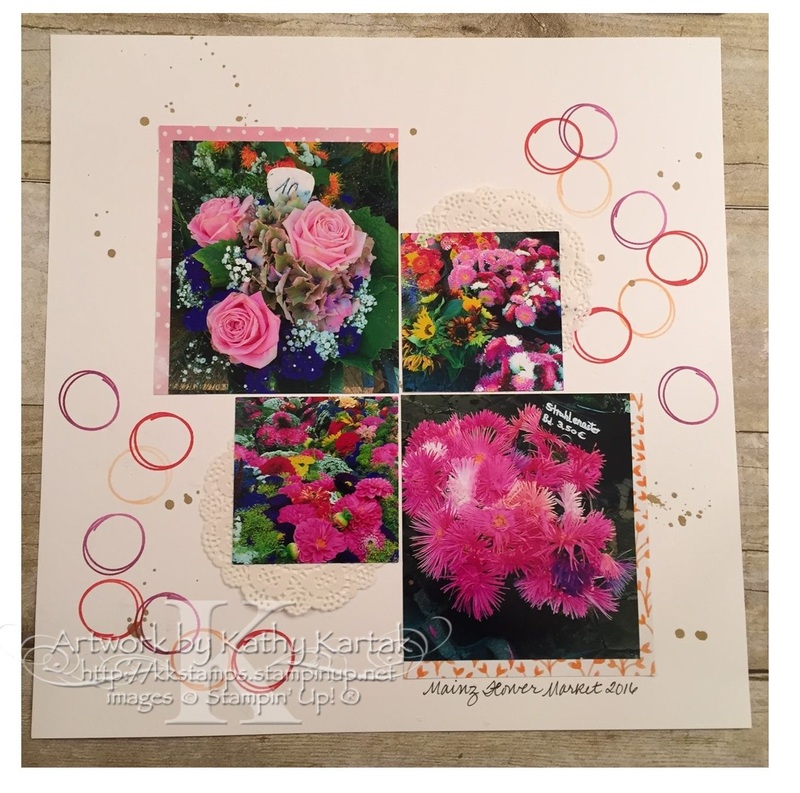 This is such a quick and easy layout and the Whisper White page lets the fabulous floral colors shine!